Wonderful! 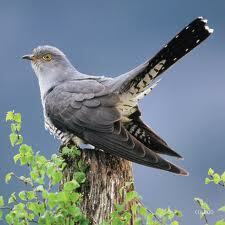 Our first cuckoo has started to call . . .
Actually the iconic call is that of the male (the females have a totally different bubbling call that blends into the background cacophony of spring bird song). Cuckoos are shy creatures: grey birds about the size of a dove, with a hawk-like flight that is easily mistaken for a sparrowhawk or merlin. As a result they are mobbed mercilessly by small birds, particularly during the early breeding season. It is tempting to think the songbirds instinctively recognise the threat presented by these brood parasites, but this is probably more a case of mistaken identity. In reality cuckoos have to be far more subtle: their craft is all about tricks and lies. Rather build a nest and rear their own young, females sit and intently watch the activities of small birds. They watch their courtship and nest-building and when their victims start to lay, slip in to lay a single egg among the others. The female repeats this process up to 25 times in a season, preying mainly on dunnocks and reed warblers in lowland Britain, or meadow pipits in hilly areas (although flycatchers, wagtails and whitethroats can also be targets). The battle is far from one-sided, however, thanks to a very high failure rate. More often than not the host spots something amiss and either ejects the changeling egg or abandons its nest to start a fresh one before the parasite breaks out of its Trojan horse. Those that do escape detection are miracles of instinct, however. As soon as it hatches, the chick heaves everything else out of its adopted home to force its foster parents to pour all their efforts into its huge yellow-rimmed orange gullet. This triggers such a powerful feeding response that it can even flag down neighbouring birds laden with food for their own chicks. Most birds learn from their parents what to eat, where to nest, how to socialise, what to look for in a breeding partner and where to migrate. Cuckoos never see their mother or father, however, yet are pre-programmed with a wealth of information. Their foster parents will certainly not feed them hairy bombycid moth caterpillars (the irritant spines make them inedible). Cuckoos have a renewable stomach lining which protects them from any ill-effects, however, and the young cuckoo discovers this for itself soon after leaving the nest. Most incredibly, however, next year they will find and mate with another cuckoo – a bird which they will have never seen or heard before. Females do learn one thing from their foster parents, however: how to recognise their own victims. A cuckoo hatched in a dunnock nest will prey on dunnocks and over time this has created host-specific ‘lines’ (gentes) of female cuckoos which lay eggs that roughly match those of their host. Cuckoos are found almost everywhere, but tend to avoid built-up areas. A recent drop in dunnock and pipit populations is thought to be behind a significant decline over the past decade.